Since the launch of its first report a year ago, Startup Genome has been doing a great job of combining scientific study of the way startups operate with tools that help entrepreneurs improve their chances of success. Now it’s expanding its offering with a tool to assist investors. The new Investor Compass follows in the footsteps of the Startup Compass which launched last August. Whereas that used data about 3200 high-growth tech startups to provide tools to help entrepreneurs avoid scaling their businesses too soon, the new product lets investors, advisors and service providers track the progress of the companies they work with. Startup Genome, founded by Bjoern Lasse Herrmann, Max Marmer and Ertan Dogrultan in California in December 2010, doesn’t aim to entirely replace traditional human interaction and intuition with data and dashboards. The team stresses that this more about using key metrics, presented in an easy-to-parse way, to make decision-making processes easier. 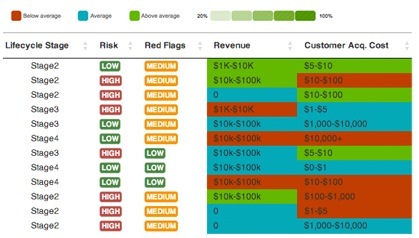 Tools like the Investor Compass arguably point to a maturation of the startup market. “This augmented view of a portfolio’s performance enables investors and advisors to quickly see who is doing well and who isn’t, and then decide what actions they need to take,” Startup Genome states in its information package for the new release. “Every new industry that data flows into it seems to disrupt. The game of baseball changed when Billy Beane brought in the quants. Wall Street is now run primarily by high frequency trading algorithms designed by quants. Investor Compass launches today in beta. Meanwhile Startup Genome is set to close a round of funding next week that will bring influential startup theorist Steve Blank among others on board as investors.